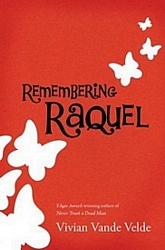 Raquel was never very popular, that is, until the day she died. This was a very interesting novella (it’s short). I only took me a couple hours to read and that was during school, so less than that if I had read it straight through. It’s about how people react to this girl’s death. She’s overweight, unpopular, and plays online fantasy games, and everyone has a different reaction to her death.